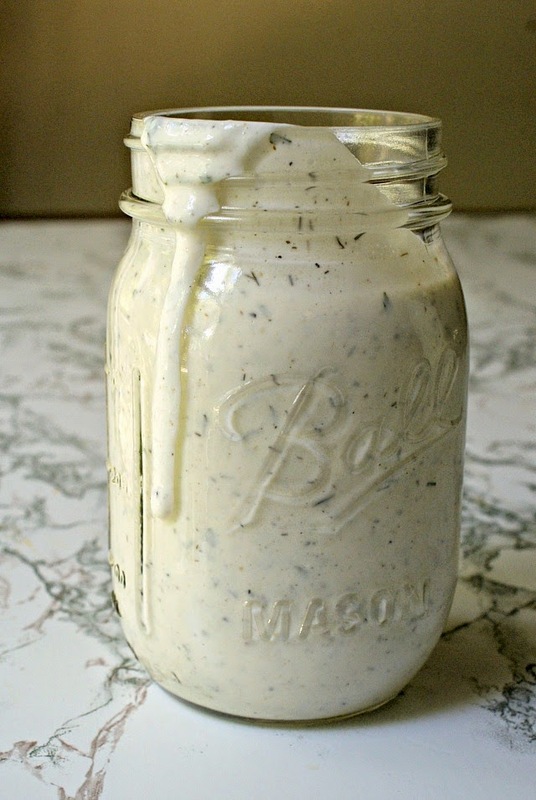 Greek Yogurt Ranch Dressing uses thick and rich Greek yogurt combined with a mixture of herbs and spices to make a healthy version of classic ranch dressing. I am a sucker salad dressing. What's funny about that is that when I was young I wouldn't touch it. I ate dry salads for years. Crazy, right? But now I like them all. I'm particularly fond of the creamy, thick, rich ones like caesar, ranch, and parmesan peppercorn. Yum, yum and yum. It's a little disturbing when you actually start reading labels and realize that the dressing you are putting on your salad has more fat and calories than the actual salad itself. No bueno. Kind of defeats the purpose of trying to eat a healthy salad when you load it up with fattening dressing! I've recently started making my own dressing at home, like simple vinaigrettes and this Avocado Cilantro Dressing. I've tried a couple versions of homemade ranch mix and I'm thrilled to say that I finally found one that I LOVE. I used a Greek Yogurt base and a mixture of herbs and spices to make this super simple, healthy and delicious version of ranch. Of course it doesn't taste exactly like store-bought bottled, nothing ever tastes exactly the same when you aren't using chemicals and stabilizers that make them shelf safe. I think it actually tastes better than store bought. Will you love it, too? Only one way to find out! Combine all of the ingredients in a bowl and mix well. Cover and refrigerate for at least one hour before serving. You can adjust the amount of milk depending on how thin or thick you like your dressing. Just be aware that it will thicken up a bit after sitting in the refrigerator for a while, so take that into consideration when you're making it. If you want to make a ranch dip instead of dressing, you can cut the amount of milk way back and use the dip for fresh veggies! sounds perfect, how long can I keep it in the fridge?